I’ve now been in the market for Dazar’alor BoEs for two weeks and it’s about time to share my experience so far and what my suggestions are. I have still not found the optimal approach on any of my realms, so if you want to enter this market you will have to make some serious effort in refining your approach. So far I have spent 5.1 million and made back just 1.5 million. This is definitely the least attractive BoE market I have entered so far in terms of break-even, and you should stay away unless you can stomach a lot of risk. I do expect to make gold eventually, but so far it has been much more of an uphill struggle than in the Uldir tier as well as the former tiers in Legion. So far I’ve had success across items. I do not really have enough data to see which items are most profitable. The one thing I have noticed is that the cloak is generally much more prevalent than any of the other items. This would make sense as it covers all specs potentially. I expect it has a much higher drop rate. This means that you run a much larger risk of people undercutting you with new items for the cloak, so I suggest sticking to just flipping very high item level variants of the cloak. 400+ is the way and sockets are very important. As I expected the 400+ segment is definitely the most attractive. 385-400 can be good, but the supply is generally very high for these item levels and it is hard to find good deals. You should avoid buying in this bracket unless you can get a 40% expected profit margin by comparing the buy price to your minimum price. 400+ has lower supply and thus a much larger chance of finding good deals. The demand for higher item level items is of course significantly higher as well. Sockets are so important they require their own section. Sockets generally are worth 5-15 item levels in terms of gold. It depends on the slot and the item level. In terms of stats the value is generally about 10 item levels. Sockets are extremely important to look for when shopping. This is also one of the major sources of people mispricing their item. If they only look at item levels and disregard the socket you can get a great deal. This will always show up with a significantly lower price relative to dbregionmarket. As usual I rely on search strings to look for deals. The first thing you should do is to set the default shopping price source to dbregionmarketavg. I prefer this as it gives a much better price anchor. 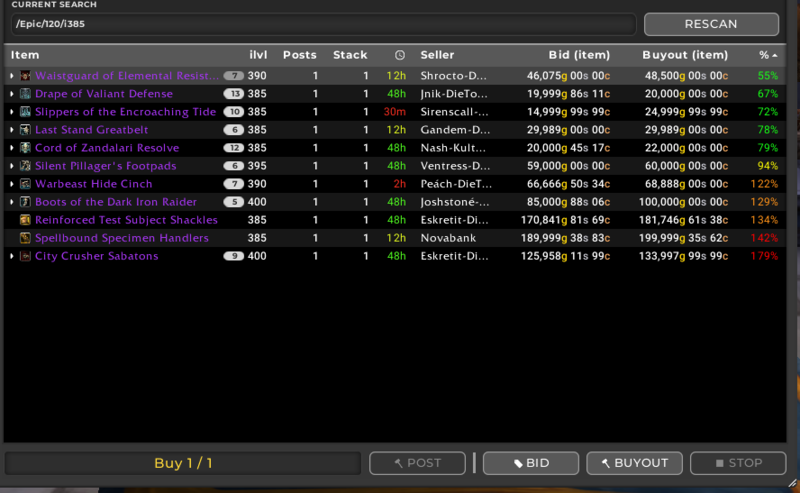 You will have to learn how your realms BoE market compares to the region market for BoEs. Ultimately the main way to find deals will be to compare items to the second cheapest of the same variant. I like to use the string that shows all items above 385. It will give you a good look at all the relevant items. The result pane will give you a great look at how the general level of the market is on your level. 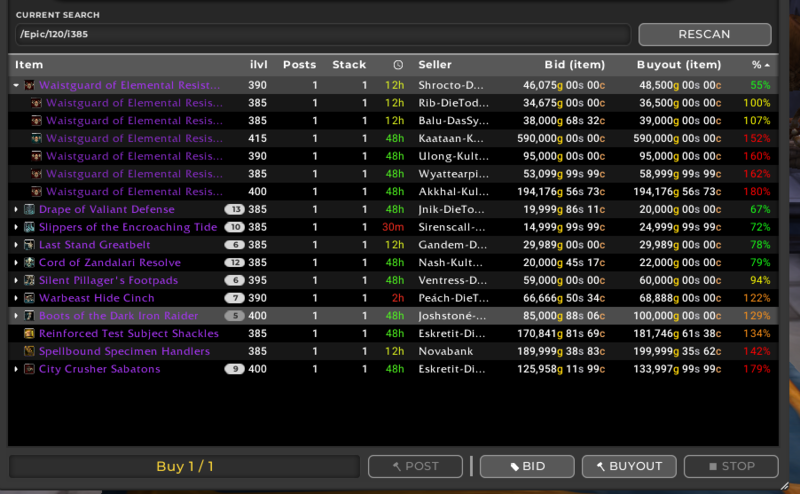 I like to use a minimum price at around the level where 1/3 of the auctions show up below it. On this realm that might be in the 80-90%dbregionmarketavg level based on the results below. The search string used is on the form /Epic/120/i385/ where the i385 part sets the minimum item level. I try to buy items with at least a 20% profit margin so this means there will be 1-4 items that have possible deals when you run a scan. The screenshot below shows an example of a good buy as there are no other 390 waistguards and it is posted much cheaper than the other items relative to the region market value. Always compare the price to the second cheapest and make sure the gap is at least 20 % so you have a nice profit margin cushion. Continuous improvement is essential. You will have to experiment with your posting prices and buying thresholds. Maybe it is better to buy more deals and price them slightly higher, or you may want to buy at a lower threshold and post them lower as well. The dynamics on your realm is something that can only be learned from experience, so get ready to experiment and make some potentially expensive lessons. 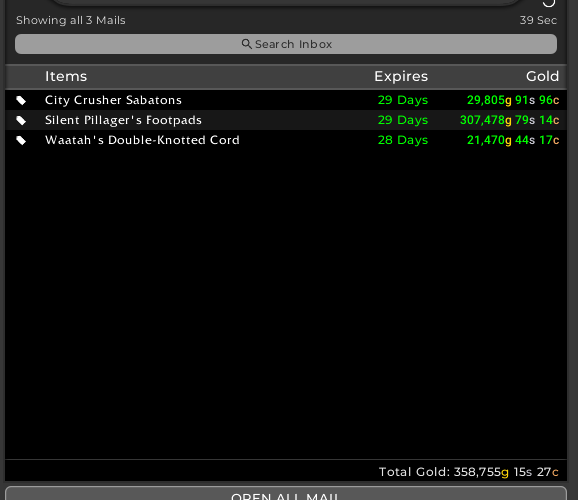 I am 3.5 million in the red so far, and I’ll be spending more gold going forward. So if you choose to enter this market you will get to test your risk tolerance to it’s breaking point! If you want to level up your gold making consider supporting my Patreon. I have noticed there are much more BoE farming raids at the start of the raid tier than compared to legion. The change in forced personal loot has also changed the ilvl-relevant BoE market as well. Mythic raiders will usually buy as much high ilvl gear as possible to increase the likelihood that their progression will allow them to funnel loot to core raiders, so the demand of ilvl gear is extremely high at the beginning of the tier, but drops off immensely after a few weeks.